In last October a fascinating triple trans-Neptunian object was named Lempo from Finnish mythology. 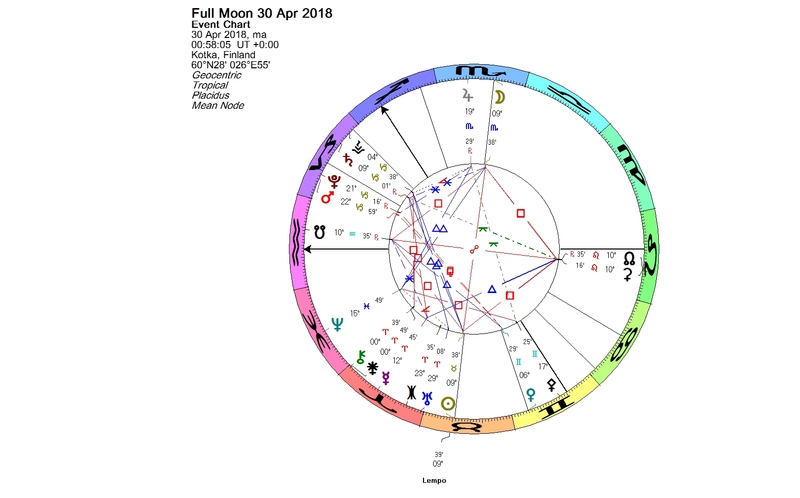 A Full Moon is always an opposition of the Sun and the Moon, and now in the Scorpio Full Moon chart, the Sun in Taurus is in exact conjunction with Lempo. The luminaries – and Lempo – are squaring the lunar nodes, the points where the yearly path of the Sun and the monthly path of the Moon intersect as seen from Earth. The nodes of the Moon are always opposite each other, forming the nodal axis, the meaning of which in astrology is often seen as karmic. The north node relates to the future and the south node to the past. The chart degrees squaring the nodes are seen as balancing points. Lempo is on that important threshold right now. Astronomically Lempo is a unique multiple system. It is a plutino consisting of three bodies, which are all similarly sized, having diameters within 100 – 300 km. The two inner components form a binary. The third component is circulating the central pair. In this respect Lempo resembles the Pluto system, where four small moons are orbiting the central binary of Pluto and Charon. The Lempo system has been proposed as a possible target for future missions to the Kuiper belt. Lempo was originally worshipped in Finland as the goddess of love and fertility. According to the myth, a glowing fireball shot from the sky and hit the ground. It was the sacred Fire Woman who came from beyond the visible world. The myth describes a meteor hitting the ground a long time ago. At first people were scared, but after they realized all the advantages which she gave to them, they became the people of fire. She gave them fertile soil, tools and weapons, she lit the flame of love, and she escorted the dead to the Otherworld. There is a municipality of Lempäälä in Finland. The name supposedly originates from the fact that worshippers of Lempo lived there in the region. The name originates at least 2000 years back from the Iron Age. In Finnish folk poetry all “lempo” related words can be associated with fire and iron. One of the Finnish words – also in the contemporary language – meaning love is “lempi”. The word “lempi” originally meant a literal fire or a flame. The same kind of fire or burning sensation can be used to describe an internal state of a person. Christianity gained a foothold in Finland during the 11th century. The reputation of Lempo worsened and she was equated with the devil. There are sources, according to which Lempo disappeared after the Christianization. But when people heard about Bridget of Sweden, they thought that she was the reborn Fire Woman, and the worshippers of Lempo turned to Saint Bridget. Bridget of Sweden (1303 – 1373) was a mystic and saint, and the most prominent religious and political figure in Scandinavia of her time. She was proclaimed a saint on Oct. 7, 1391. Bridget of Sweden is celebrated on 7 October. According to Kustaa Vilkuna (1902 – 1980), a well-known Finnish ethnologist, linguist and historian, there was a big feast held in her honor every year in Lempäälä. We could even talk about a cult of Bridget. People dressed in their best clothes, drank beer and celebrated. Feasting was obviously thorough, because there is an old saying in Lempäälä, according to which the next day was also needed as a holiday. According to Juha Kuisma, a native born resident of Lempäälä, who has studied Lempo and the history of Lempäälä, at least part of the cult clearly originates from the time before Christianity. Note, that both the discovery date of Lempo (Oct. 1, 1999) and the publication date of the naming (Oct. 5, 2017), are very close to the feast day of Bridget of Sweden, Oct. 7. The medieval church of Lempäälä is dedicated to Bridget of Sweden. The church was built near a deep pit (now filled with grit), which according to the lore was once called “Lempo’s pit”, and was possibly caused by a meteorite. It was still marked on the 19th century maps. Archeological studies have shown that there was also a pagan cemetery at the site. Lempo is mythological fire, which came from beyond the visible world. Likewise, we can say that Lempo is creative fire burning inside every one of us. Lempo is passion and attraction. Soon after the naming of Lempo I saw a television documentary of Jimi Hendrix performing at the Atlanta Pop Festival in 1970. It has been said that his concert was almost like a spiritual experience. His playing was free from restrictions, he was dressed in red clothing and he looked like a flame. 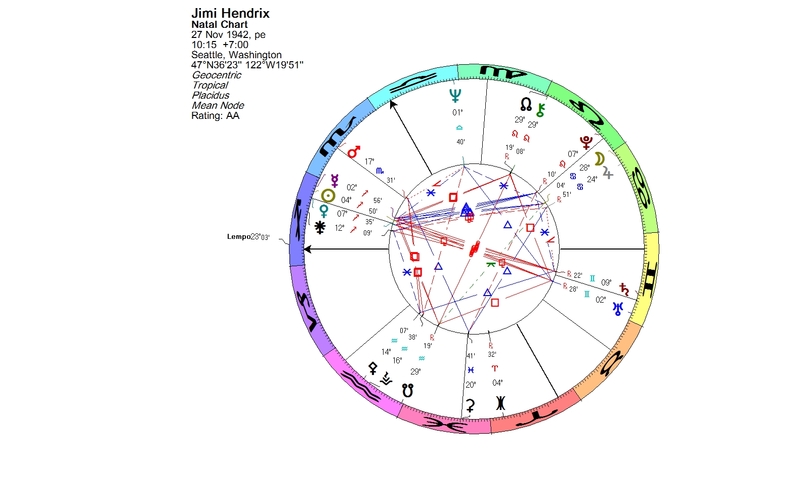 In Jimi’s chart Lempo is rising right at his ascendant in Sagittarius. This entry was posted on Sunday, April 29th, 2018 at 8:32 pm	and is filed under Full Moon. You can follow any responses to this entry through the RSS 2.0 feed. You can leave a response, or trackback from your own site.